"You're listening to Newsradio 88, WCBS. Good morning, I'm Lou Adler." "Good Morning, I'm Jim Donnelly... 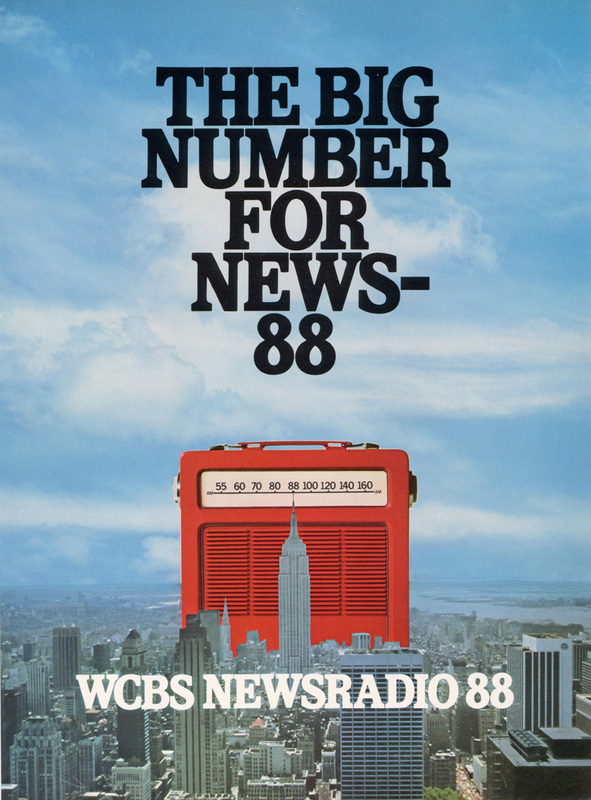 Sunny, breezy, comfortably cool day today, high 58 to 62... "
Hear how WCBS sounds in 1978, plus an interview with WCBS news ops manager John Wheeling. "... It's eleven minutes to seven of clock on Wednesday morning... and good morning Neil Bush, trick-or-treating in the traffic watch helicopter... put down your candy bars. "Good Morning, Jim and Lou... and I certainly hope everybody's car made it through last night [Halloween] without too much of a problem...As you drive in the morning, very, very good conditions... as you're coming inbound in fact on that Long Island Expressway, approaching the midtown tunnel... look at the new Citicorp building... it's like some sort of futuristic gantry for a rocket launching pad, that silvery orange building... and by the way on the upper Brooklyn-Queens Expressway, we're all cleared up southbound... remember yesterday morning we had a tie-up there all rush-hour long... we're OK now emptying into Brooklyn from Queens... we'll have a full report right before seven." 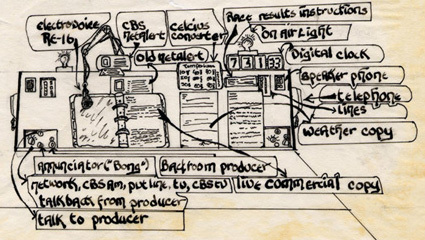 Like rock and roll or a classical stations, all-news outlets have crafted formats to reach their audiences, and they strive to be interesting and innovative. 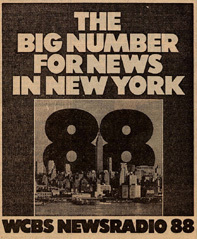 "I talked to a fellow ... who said that in his mind, the really contemporary radio stations in America today were WCBS and WINS," says New York Market Radio, Inc's Executive Editor Maurie Webster, "because they are doing what he personally considers to be the new things." "I don't want to say we're 'news jocks'..." reflects WCBS Afternoon drive anchor Ben Farnsworth. "But basically, ... our job is ... to present the news in the most interesting fashion possible. And that means setting things up in a way that they'll sound good on the air. 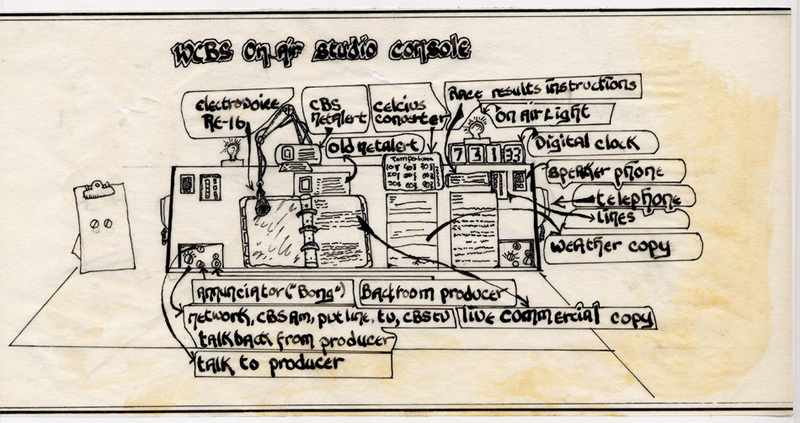 And our job is to talk between the reports, the features, the information... using the weather and other things, much in the way a disc jockey would in terms of backtiming or in terms of just adding a little warmth to what we're doing." "News doesn't necessarily have to be boring," says Farnsworth. "It shouldn't be boring in fact, if it's done right. It should be people-oriented because what people care about is other people. Yes, you might say that talking about the economy or some other facet of the news can at times be boring, if it's handled in a boring fashion. But if it's handled in terms of how people become millionaires or how they lose their fortunes... then it becomes more interesting. And that's really .. our job: to cover the news in an interesting fashion, so that the listener wants to hear it." WCBS works on an hour-long format, broken into two half-hour segments. Its competitor, WINS, uses 20- and 30-minute schedules, depending on the time of day. The programming and structure of the two stations differs substantially. 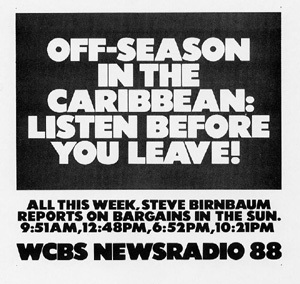 A newspaper ad for one of the features typical of WCBS programming throughout the day. "It's a one-hour format formally," explains John Wheeling, Manager of News Operations at WCBS. "But it can also be considered two half-hour cycles -- sort of two half-hours that reflect each other... with different information, but in the same format. WINS, every twenty minutes, goes into its sounder and it starts anew. Every twenty minutes. And they'll repeat the same stories... That's the schematic difference between the two. [At WCBS] we cover stories in much more detail, and we do a lot less rewriting of wirecopy, ,in-house on stories our reporters could get to. And we like to think we cover stories in more depth -- more realistically." WCBS has a larger staff (enabling it to cover more), and a network (giving it access to more features, audio, and big names like Walter Cronkite). The station runs longer features about medicine, economics and consumer issues than WINS. Because they can't know when listeners are tuning in, both WCBS and WINS must repeat stories regularly; having different written versions and angles becomes essential. Rewriting stories and creating different versions "is the only thing that saves us," says Wheeling. "The audience likes to give us the benefit of the doubt, and is kind in that way, but if we kept feeding them the same exact thing after an hour they're have the spots memorized. So, it'scritical that we have different versions of the same story -- take different things from it: different angles, different leads, different cuts of actuality [sound bites] -- anything we can do to make it sound different." "And, sometimes journalistically it helps because you can't get the full story in one 45-second spot. With three different 45-second spots, you can probably get all the information available on that particular story." Anyone who's listened with WCBS has to be impressed with the split-second timing heard when hitting the network news or connecting with the traffic helicopter or remote reporter. WCBS news anchor Ben Farnsworth talks about what it's like to be on air at the #1 all-news station in the #1 market. "The timing has to be very precise at two times: On the half-hour, and on the hour," explains PM drive anchor Ben Farnsworth. "It has to be timed to the second on the hour, because we have network news at 11 o'clock, 12 o'clock, and what have you -- and that comes precisely on the hour... and then on the half-hour, we have our own time tones that automatically come on at exactly (say) 10:30." "We have other timing that is not critical, but is important. That exists between commercials, between programs. And by that kind of timing I mean we can't bunch too many commercials together... we can't bunch too many features together -- only because it's bad programming and it doesn't lend itself too well to good listening." The WCBS anchor studio is a technological marvel, where anchors sit facing a sophisticated control board that aggregates functions ranging from incoming phone lines, live network feeds and alerts, and helicopter traffic alerts. The spacious studio can accommodate two anchors and mutliple guests. Though the control board provides a smorgasbord of information and controls, all heavy technical work is actually orchestrated by an engineer in an adjoining conrtol room. Despite the high-tech accouterments, the anchor studio has a remarkably comfortable feel. One thing anchors particularly appreciate about the WCBS studio is that they can work without wearing headphones. 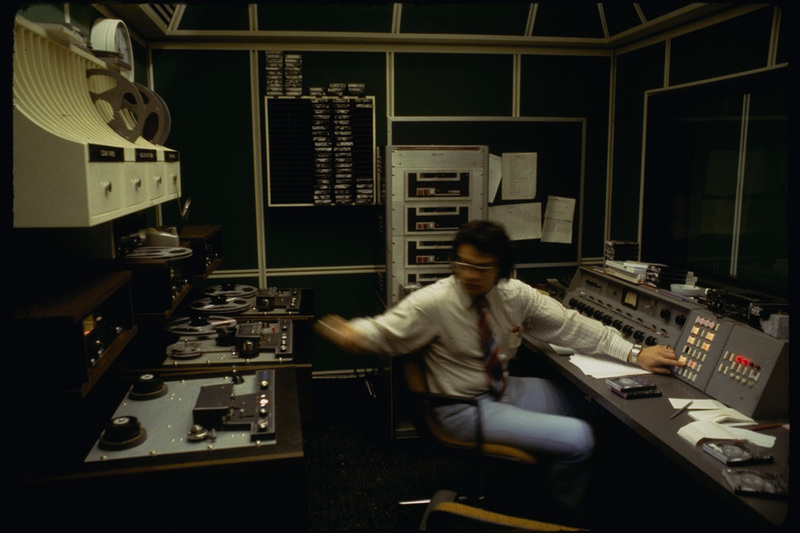 While newscasters at most of America's stations work with a set of "cans" on their heads (so they can hear their on-air presence and listen to outcues), the WCBS setup allows anchors to work headphone-free. 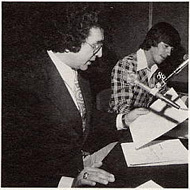 Afternoon anchors Pat Parson (left) and Ben Farnsworth work "headphone-free." "I have worked with headphones throughout most of my career," says PM drive anchor Ben Farnsworth. "Here at CBS they have a marvelous system where we can actually have the monitor on live in the studio. I much prefer it that way, only because you don't have to wear some kind of cumbersome thing on your head. I can hear directly when we do a lot of co-anchoring stuff with another person. You can him or her directly. You don't have to go through the sound system, and it really becomes a much more fluid, open kind of newsroom situation -- particularly when you bring other facets in. When you bring in people for interviews, they don't have to get headphones on. They're confused enough sitting in front of a microphone... and this makes them feel like they can relax in their living room . There's a chair there and there's a mike there, and that's about it." "The reason it was originally engineered this way was not such much for news but for talk radio," explains Farnsworth. "CBS used to have a lot of talk radio stations, and it was fantastic because you could hear the phone through the monitor, and they could hear you directly through the mike. You didn't have to pick up a phone and didn't have to talk through one of those sqwak boxes." "We have an assignment editor, and we trust that person's judgement as what is the most important thing to cover -- the most important eight stories to go out on, out of fifty or five hundred good possible stories. And it's very difficult. All journalists suffer these agonizing decisions every day. Especially assignment people. People involved in these assignments. After a while you begin to learn what stories you can cover, and what stories you can't really cover with what you have available... and you have to kind of throw that into the mix every morning, and decide which stories are the most efficient and which ones we must cover." The WCBS newsroom: A commanding view from the vantage point of the WCBS producer on duty. "We'll send reporters out, and we'll change those assignments at the drop of a hat. Obviously, if a better story breaks, we'll call a reporter off of what he's doing and put him on that other story. It's a continuing review of what's going on." "Generally, the top two or three stories are easy," says Wheeling. "You'll know which ones these are. It's what you do with the other four or five reporters that you have... how do you get your best use out of them for that particular day. That just comes from experience. You know what reporters you have available, how they can handle a story, what they can do with a story. Sometimes, it's just a gut level instinct: The assignment editor will feel 'I know there's a story here, and I'm gonna put somebody on it,' and hopefully, that pans out. But, you never really know. It's a difficult thing to do. We have daybook material. We have some future files, and of course we rely on all the daily services, the wire services and so forth to get leads for stories." "Covering news in New York City is a very difficult thing to do," says Wheeling, "because of the nature of this town, its complexity, and the difficulty of getting around in this town. One of the things that's very important for a reporter at WCBS is to known New York City. Very basically: The subway system, how to get a taxicab. Buses. How to get around in this town. The other thing about knowing New York City are the intricacies of its government: What makes the city work, how it works. The commissions, the structure of the government, and the various committees and boards and everything else. Also, the personalities that they're going to be confronted with every day." "So, we don't really look to the midwest to hire a New York City reporter, because there's a certain amount of time that that person -- even though he or she may be a terrific journalist -- is going to to be trained: Basic training. Here in New York City. That can last six months to a year. Maybe longer. So we would much rather go to someone who has been working in town, for a long enough time to really know the city, so they can perform for us from day one. So there's no training period." "Disasters Are Where We Shine"
News listenership grows markedly during disasters or weather emergencies, and all-news stations are well prepared with standard operating procedures for emergencies. "[A big disaster] is what we live for -- that's when we really shine," admits Wheeling. "And, it's a good thing. A disaster is a good think for us: That sounds terrible, but that's the nature of the business. We know when there's a disaster -- when there's a really big story -- we're gonna have more listeners than we are gonna have any other time. So, we pull all the stops at that time... The thinking [is] that if these people like what they hear... if they're satisfied... well, they will come back when there is not a disaster. They'll come back tomorrow because they like what they heard. So, it's an opportunity to get a whole new group of listeners -- to convince a whole group of people that we can do what we claim to do, and that's news better than anyone else." 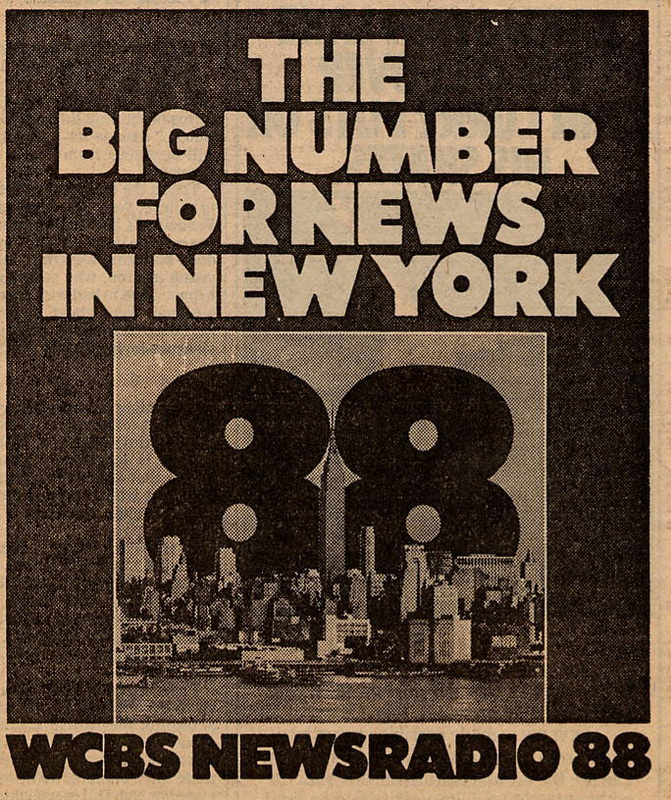 In November, 1977, WCBS ranks as the #1 all-news station in the city. "They go back and fourth between forth and fifth in the ratings overall," says Associated Press New York broadcast bureau chief Mike Collins. "WINS [the rival all-news station] could be on top next time." So, what audience is WCBS targeting with its rich features and fast-paced news coverage? "We're aiming for everybody we can get actually," quips News Operations Chief John Wheeling. "But demographically it's general male, 18+. That's the most valuable demographic as far as we're concerned. Of course, we're always looking for women especially in the mid-day periods when that male demographic is not necessarily available to listen to the radio. So, generally you could say it's men and women 18+, seven days a week." As the #1 all-news station in the #1 market in the country, WCBS seems to have hit its mark. WCBS Picture Gallery - Photographs from WCBS newsrooms and studios. WCBS Ads, Ratecards, Brochures - Ads, promotional brochures and rate cards. WCBS News Format - Broadcast format from a partial hour of a typical morning, Fall, 1978. WCBS Schedules - Brochures and schedules for AM drive time, PM drive time, Daytime, Nighttime and other slots. 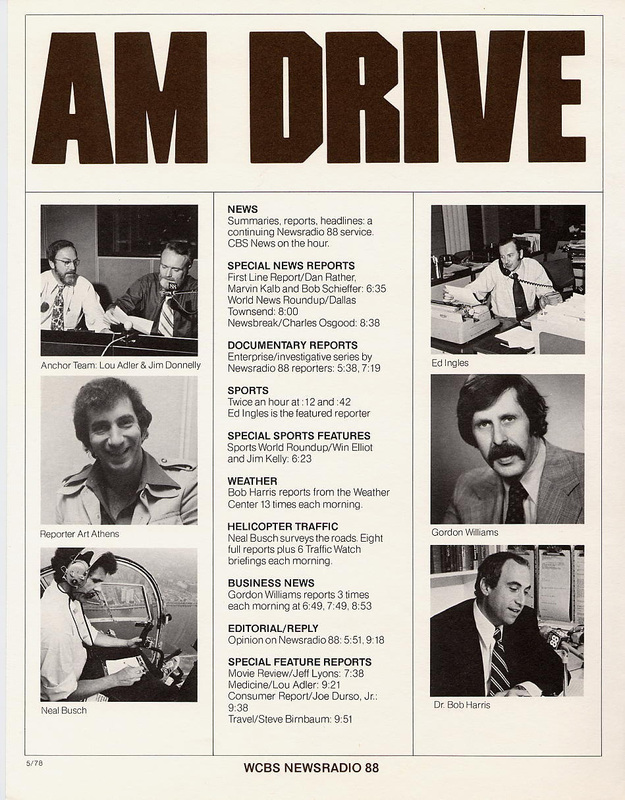 Two Hours of Morning Drive - Minute-by-minute schedule rundown of two hours of morning drive programming for November 1st, 1978. WCBS Scripts - News scripts from WCBS. WCBS Datasheet - Station stats on staffing, wires, cart machines, and much more! 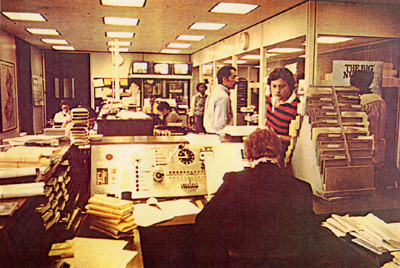 WCBS Then & Now Gallery - Comparisons of WCBS from 1978 (last century) and 2004 (this century). 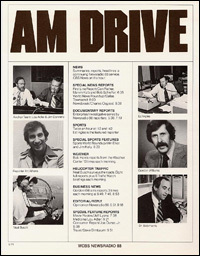 Associated Press Daybook - An example of the "daybook" feed from the AP, used by WCBS assignment editors. WCBS Anchor History - A partial chronology of anchors and personnel at WCBS. 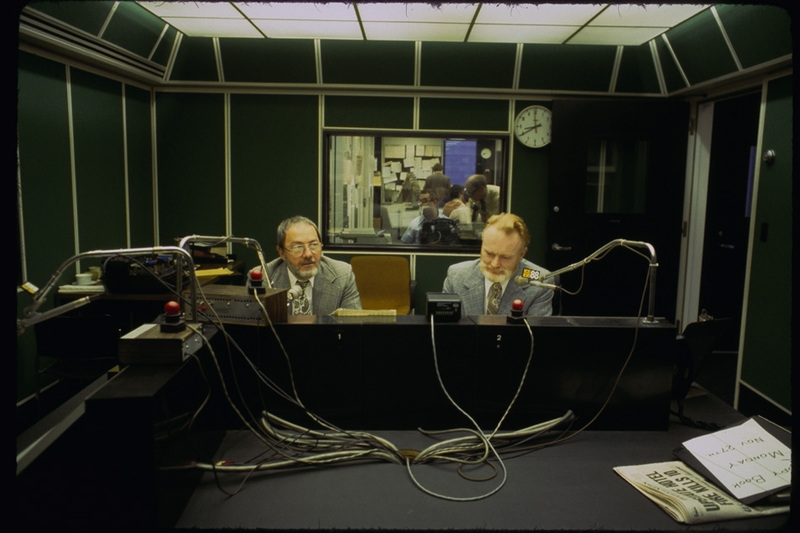 WCBS and NYC stations in the 1964 New York City Blackout - A recreation from Broadcast Engineering magazine, by radio historian Jeff Miller. Today's WCBS - The WCBS Newsradio 88 site (check out the cool on-site Photo Album / Tour).